Microsoft announced the next Microsoft Exchange Conference (MEC). Another MEC is going to be held in …… 2014. Last MEC was in September 2012 in Orlando. It was good oportunity to share your ideas, ask questions and discuss your Exchange Server related concern with Microsoft Engineers, Exchange Server MVPs, and with all other Exchange community folks around the world. Microsoft Exchange Conference 2012 in Orlando was held 10 years after the last MEC. But we hope it will be every year. On WebSite I am MEC you can find information about MEC 2014. We don’t know when, only April 2014, and we don’t know where. 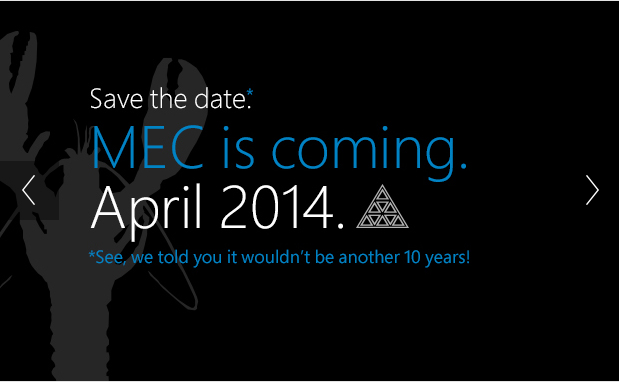 What will Microsoft present on MEC 2014 ? We don’t know yet. Maybe new Exchange Server, or new features for Exchange Server 2013 or SP1. Where … maybe in Europe, but we don’t think so. Tagged MEC 2014, Microsoft Exchange Conference. Bookmark the permalink.